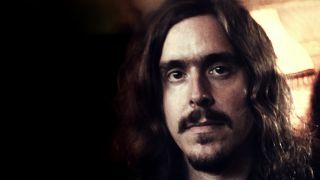 Opeth’s Mikael Åkerfeldt on drink, drugs and democracy. I’d made up my mind that I wanted Latin quotes to go with the painting on the cover. So I typed ‘Latin quotes’ into the internet and up came shitloads of stuff. I chose the quotes that fitted the painting, and then I found out who they were by. I had to make sure it wasn’t someone controversial, like Hitler. I’m a working-class social democrat. That’s run in my family for many years. But I’m not very political and I’m not extreme in my views. I wasn’t interested in politics at all when I was growing up. I only became interested when I started paying taxes and having children. Then you suddenly want to know where your money’s going. Yes. I make sure there’s food on the table for the kids and that they have clothes and that the bills are paid. After that I don’t spend much on myself, so I spend it on records. There’s something calming about flicking through record racks. No. I would probably call myself an atheist. I don’t know what to say about religion, but the word that most comes to mind is ‘retarded’. I understand when people go through a tragedy and don’t know where to turn that they can find solace in God and religion. I have no problem with that. But when organised religion makes people kill each other, then I think it’s insane. I was into sport. I wanted to be a pro footballer for Juventus FC, maybe, or a tennis player. But I ended up studying electronics in high school. If you weren’t a musician, what job would you have done? I’d have been a TV repair man. That’s what it was leading to in high school. I did a lot of soldering. But I didn’t like it. Fortunately I discovered the guitar. That I’m stuck up. Some people think I’m some megalomaniac rock star. Where do those criticisms stem from? I speak my mind, and metal fans are very sensitive to any criticism of the genre. What’s wrong with having opinions? My children. I have two daughters. I came off a six-week North American tour, with all this tension on the band and me, and the day after I was pushing my kids on the swings in the park. That was good for me. Do you ever play them your music? Sometimes when I’m driving, my eldest daughter, who has Spotify on her phone, will put on one of my songs. But I say: “Turn it off.” I like hearing my own music when it’s new, but I soon get to the point where I find it almost nauseating to listen to. What are the best and worst drugs you’ve ever taken? We’re Swedish, and if you smoke a joint in Sweden it’s almost like you’re a smack addict. But we drink with a clean conscience. We get fucked up on drink on Friday night and Saturday night, and then have fights. So drink is both the best and worst drug. Probably what happened after I accidentally smoked a joint that had magic mushrooms in it. I didn’t realise. That was certainly my least proud moment. I was in a hotel room with the band, and this record label executive was there. I was so wasted I grabbed his hair and stretched it so his head was back, and poured a whole bottle of vodka in his face. I remember the room went completely silent, and all you could hear was the ‘glug, glug, glug’ of the vodka pouring out of the bottle. Nearly. I once found a marker pen on the subway and decided to draw inverted crosses and pentagrams on the timetable. Nine coppers suddenly appeared. They said to me: “You are the scum of the earth, the lowest of the low.” But I was so drunk I couldn’t stop laughing. And then I asked them for a ride to the pub. That’s a very ‘metal’ thing to get arrested for. It’s very metal. But that was a long time ago… about six months [laughs]. Pale Communion is out on August 26 via Roadrunner.